My parlour lady is an Oriflame rep and always claims very high of their products (not all the products) and their super effects. And as my old night cream had started seeming little too oily for summers (though was working fine in winters), I asked her about night creams and she suggested me a Grape antioxidant night cream for combination skin. I was little sceptical at that time as I had never used any Oriflame products before, but when she told me that these products are full of natural ingredients, I thought of giving it a try. 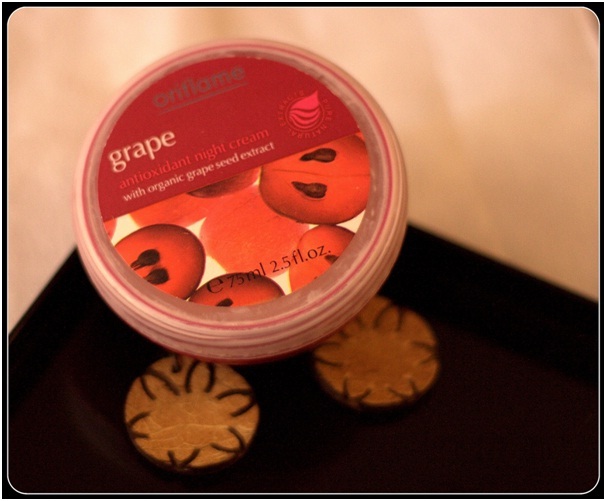 What Oriflame claims about Grape antioxidant night cream: Antioxidant night cream rich in pure organic grape seed extract. Nourishes and helps restore skin’s natural barrier. Leaves normal to combination skin soft and supple. 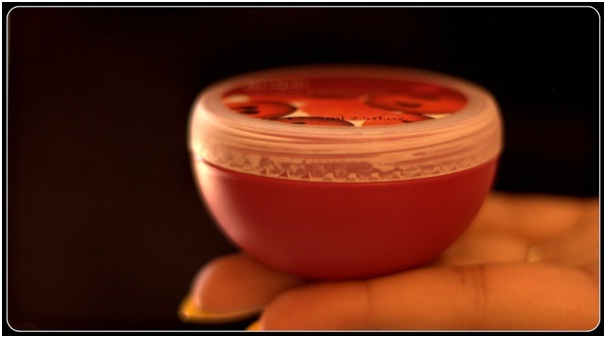 Packaging: It comes in a wide plum coloured plastic tub with a plastic cover. 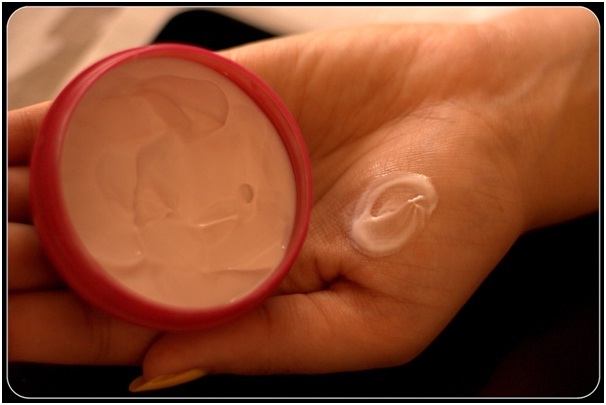 Consistency: It is an extremely smooth light pinkish white cream. 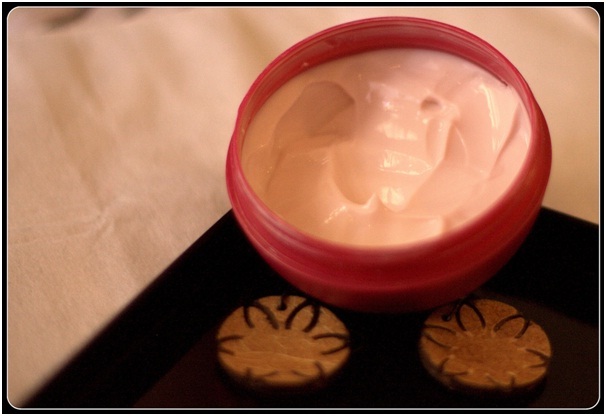 It is non-oily and the consistency is quite thin, not as dense as an actual cream and denser than a moisturiser. Application/Usage: Just take out a very small quantity with your finger and apply on your face and neck in upward/outward strokes, no need for a massage. My take on Oriflame Grape antioxidant night cream: When I tried this product for the first time, I was super amazed by the quantity of cream required. A very small quantity (may be 2-3 drops) was enough to cover my entire face and neck. Also, it got absorbed in a flash of a second leaving my skin nicely moisturised and soft. I was quite impressed by these qualities and welcomed this night cream into my night skin care routine since then. Can’t say if it made my skin super supple coz my skin is not kinda very hard or inflexible. All in all, a good non-oily night cream. Conclusion: Though there is nothing to wow about this product, it is a decent one to try. So girls, what is your skin type and which night cream do you use?? Our products can only be purchased through our consultants. Please get in touch with a consultant in your area. Please contact me whear i get this product? Hi Arpita, traditionally Oriflame products were available only through Oriflame representatives. But now, you can get these on many online shopping websites, such as Amazon, Nykaa, flipkart etc. Moreover, some products are limited edition and not part of the regular lines hence might be difficult to locate.